Leiberheim beer garden is located in the Waldperlach district of Munich. The building has a long history. 1881 King Ludwig II founded the first elite guard of this time period. The soldiers with their blue uniforms of the Bavarian Infantry Leibregiment were simply called “Leiber” by the public. In 1893 the idea to create a recreation home for the Infantry Leibregiment outside of Munich was born and the decision to build the property at Waldperlach was made in 1907. From thereon, the Leiber spent much of their free time in the so-called Leiberheim. Since 1911 Leiberheim is open to the public. After the fall of the Bavarian Kingdom and the second world war the restaurant and beer garden was almost forgotten. In 1943, a south German tobacco trader planned to use the Leiberheim as a recreational ground for its workers but the plan fell through. In 1953 the grandfather of the current owners bought the building. Several leaseholders ran it since then as a restaurant and beer garden. 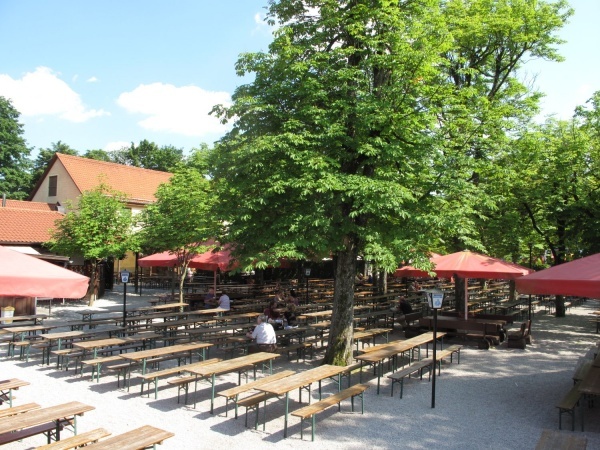 The beer garden has 2,500 seats and is well shaded by a combination of chestnut trees and large red umbrellas. The food stall offers a typical Bavarian menu. The beer served is Erhartinger and a Maß Hell costs €7.10 (April 2016). A special offer for parties over 25 people is the grilled Spanferkel (a whole grilled suckling pig). There are traditional Bavarian brass bands playing on a regular basis and major football tournaments are shown live on a large public viewing screen in the beer garden. A complimentary wlan is available in the entire beer garden, making Leiberheim a good location for social/business meetings where internet access is needed. The beer garden is open from April/May to end of September on sunny days from Monday to Saturday from 3pm and on Sundays and public holidays from 11am. Weather depending, the beer garden is also open outside the regular summer months.